This was a big RTFM moment for me. I’ve lost a lot of time with this one, and it was really simple. So I guess you are wondering why I didn’t check this :) Well in another project, it was Index.NO instead of Index.NOT_ANALYZED, and I thought that was ok, and checked EVERYTHING else, except that line you see above this text. Store.YES – Value is stored in index, so it can be retrieved by an IndexReader. At work we are using hibernate with annotations. So in some places we use the @Embeddable & @Embedded annotation. What do they do? They are both standard annotations, @Embeddable means “this class will not have it’s own table, and it will be embedded in some other’s class table”, and @Embedded means “embed this field to my table”. But still, I like the annotation solutions prettier, but this one is working as planned. I’ve very pleased to announce something that I want to do in a very long time. I’ve heard a million times “this framework is much better than <insert name> framework”, “it’s cool, but to difficult to setup” ,”too many XMLs” etc. Every framework will use the same backend (core) that has been implemented in Hibernate + Guice combination. And I’ll with test to see how simple it is to setup some framework, use a “legacy” code, and try to use the old POJO objects. Maybe I will do some performance tests as well, because all the frameworks will you the same core. All the code, examples, bugs and wiki will be @ code.google.com/p/toink. I still don’t know how often will I post here, but as soon as some framework is done, I’ll post it here. Ready or now, here we go! The first framework will be Apache Wicket! I was amazed when I first read about this library. It’s almost unbelievable what is packed in less than 850KB. Without further ado, let me represent jodd! There are two main parts, one is the general utility library, and the second being a set of lightweightapplication frameworks. How many times you had to deal with date in java? You can still feel the pain? Here is the cure JDateTime. Ever had a need to copy entire bean? Use BeanUtil. Sending email is your thing? Yup, jodd has that covered. Auto-populating forms? Checked. Also there are StringUtil, Printf, special JSP tag library and bunch more. Very useful from time to time. Second part is interesting as well. There is a slick MVC framework named Madvoc (I’ve used it in one of my projects, simple as hell), Petite (DI container, no XMLs :)), DB access layer and more. Also there you can find “Uphea“, application built on jodd framework. Installation is easy, UI is simple enough, a lot of features (different metrics, time machine, unit tests etc)… And one of the great things I love about it there is a Sonar plugin for Hudson, and you can find it http://wiki.hudson-ci.org/display/HUDSON/Sonar+Plugin. With that plugin you could analyze your code with every night build, compare it to the previous, see if you have any improvements. Cepelin is an android app that I’ve worked on with my colleges from my (now ex) firm youngculture. There was believe it or not, eight of us willing to learning something, create an app and have a lot of fun. Couple of meetings with beer, few days working on an “ueberly awesome” idea (cafe, restaurant and event guide) we actually won the golden award on VIP mobile’s Android Challenge. Members of the awesome team are: Saša Slavnić, Dragan Marjanović, Marko Simić, Željko Gavrilović, Žarko Šušnjar, Igor Popov, Igor Spasić and yours truly. My third application for VIP Android Challenge 1.0. I’ve created this application with great friend of mine Milan Delibašić. 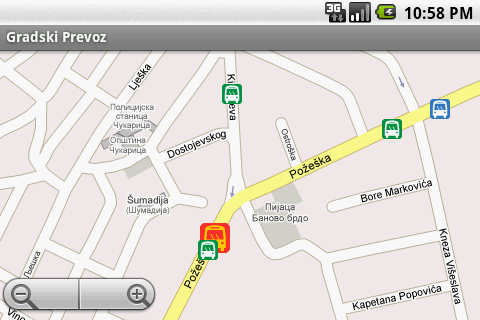 Gradski Prevoz (Public Transport) helps user in using public transport by providing information on lines, schedules and other useful stuff. Currently supports several lines of public transport in Belgrade, Serbia. My second application for VIP Android Challenge 1.0. Klopaj! 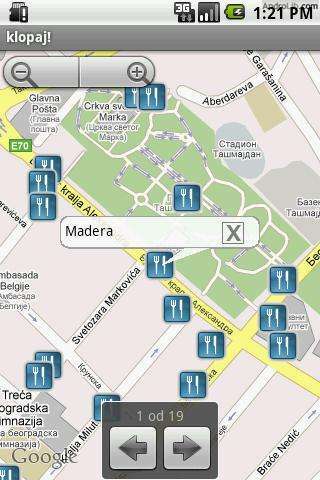 lets you search entire Belgrade for the best restaurants. Just enter type of food, or restaurant’s name or whatever you would like and let klopaj show you where it is. You can comment restaurants, added them to your favorites, love them or not. App is powered by klopaj.com website.